This posting is about the need to maintain a code of conduct in speaking. 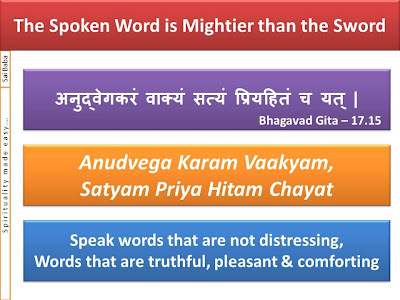 Most importantly, Bhagawan highlights the need to speak the Truth. There are five Discourse excerpts presented in this posting. These have been selected from the Discourses given by Bhagawan Baba in the years 1995 and 1996. If you slip, you can recover and get back your leg into position. But a slip of the tongue cannot be taken back. Likewise, the ones who cannot keep up the word given, how can they take up any great task in this world? If you slip, you may somehow escape and come out unscathed, but you can never escape (the outcomes of ) a slip of the tongue. If you slip, there is no loss, but a slip of the tongue takes you to hell. Students! The value that the ‘Word’ has, even a note (currency note) does not have. There are two types of notes. One is a currency note and the other is a promissory note. If these notes do not possess the characteristics that they ought to, they would be of no use. Truth is the life for the Word, the army is the life for a fort. The life for a note is the signature on it. If we forget this essence of the spoken Word, it would amount to forgetting humanity itself. Students! Whenever we need to talk, we should talk in a nice way that is appropriate to the circumstances and the situation. We must speak with all humility, in a way that does not cause pain to anyone, in a manner that is pleasing, and say that which is factual. Our words must not be hurting. But that does not mean we speak lies to please somebody. Nor must we speak the truth when it is bitter. Truth must be spoken as such, not being influenced by the likes and dislikes of the audience. We should have full faith in our conscience and speak accordingly. Only when we speak in such a manner, we would command respect in society. In order to uphold the dignity and respect of the individual, society and nation, we must consider the spoken word as our very life. Therefore, our words are verily our life. Today, we should not speak as we like, we should not speak lies and lose our respect. What is the true ornament for us. Truth is the real ornament for us. That is why the Vedas declare – Satyam Bruyaat, Priyam Bruyaat – Speak the Truth, speak pleasingly; Satyam Vada, Dharmam Chara – Speak the Truth, practise Dharma; Na Bruyaat Satyam Apriyam – never speak the truth that is bitter. Satyam Bruyaat - Speak the Truth. This is the Moral value. 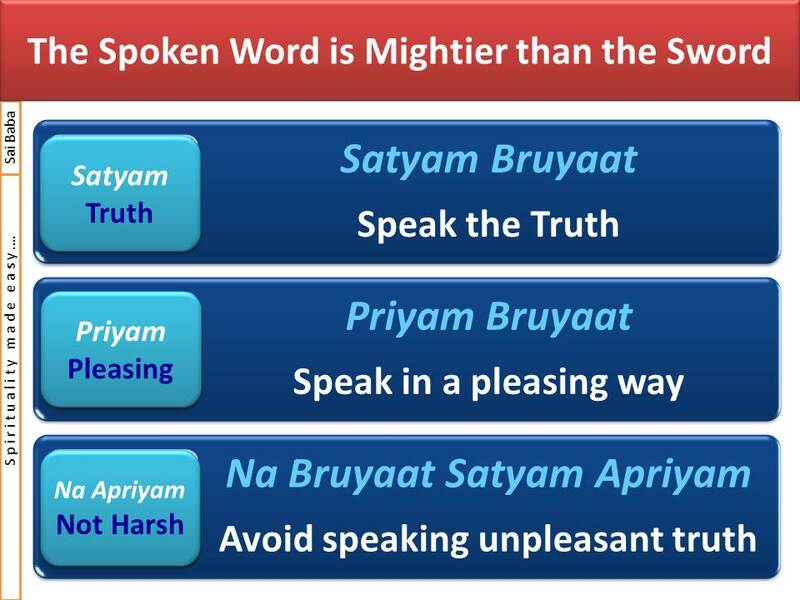 Priyam Bruyaat – speak in a pleasing way. This is the Dharmic value (Ethical value). 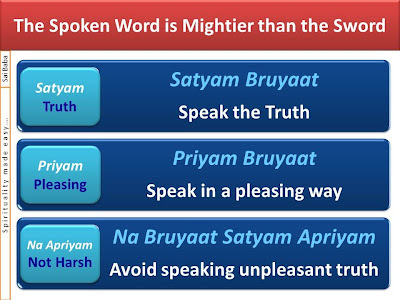 Na Bruyaat Satyam Apriyam – never speak the truth in an unpalatable way. This is the Spiritual value. Therefore, for the moral, ethical and spiritual value, Truth is of prime importance. From the moral standpoint, we must always speak the Truth. How should this truth be spoken? It should be spoken in a pleasing manner. Once we adhere to speaking the truth in a pleasing way, we would never utter a lie. Once we understand this Truth, we would be able to understand everything in life. Anudvega Karam Vaakyam, Satyam Preeti Hitam Chayat. This is a message from the Bhagavad Gita. Though we must speak the truth, we should not speak that which hurts others. On the other hand, just for the sake of pleasing others, we must not speak the untruth. The truth should never be presented in a harsh way. It must be pleasing, soft and sweet. Students! Under any circumstances, speak the truth only. In the beginning it may be little difficult. I am telling you the truth, to be honest is most easy. We need no effort to speak the truth. But to speak lies, we have to plan so much. We have to think a lot. So much effort is required. Why should we put in so much effort and engage in speaking lies? Speak the truth in a most easy way. Speaking the truth is as easy as crushing the soft petals of this flower! How easy it is to state facts as they are. If anyone asks you as to who translated the discourse, in a trice you can say it is Anil Kumar. If you want to avoid the name Anil Kumar, then you have to plan so much. Why all this trouble? Why can we not speak the truth that is seen? Most of what Bhagawan says here is straight forward. However, one aspect may seem apparently contradictory. In audio clip 3A, Bhagawan says that we must speak the truth as it is without being influenced by the likes and dislikes of the audience. However, in audio clip 3b and 4, Bhagawan states that we must never speak the truth that is bitter. So, should one speak the truth as it is or avoid speaking truth that is bitter? 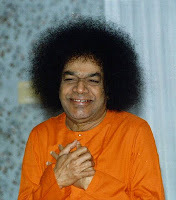 As I understand what Bhagawan means is that when the truth would not cause pain or trauma to anyone, it must be spoken as it is, without any distortion. However, when the truth is likely to cause pain to somebody, it is better to avoid speaking the same. For example, if we hear one of our associates, say Mr. X criticizing Mr. Y and speaking very badly about him, we need not take pleasure in sharing this truth with Mr. Y and causing pain to him, unless there is a specific need to do so. Another example could be when we hear about the death of say, the mother of one of our close friends, how would we break the news to him? Would we go to him straight and yell out the truth that his mother is no more? Or would we break the news in a delicate manner? In other words, in my opinion, Bhagawan expects us to avoid speaking a bitter truth, unless it is essential to correct somebody, or give feedback to somebody or is a legal/moral requirement on our side (like acting as a witness in the court and revealing the truth). Another interesting aspect is the manner in which Bhagawan builds a hierarchy even in the matter of speaking the truth. Satyam Bruyaat, Bhagawan says is the Moral imperative. This is associated with the heart or the intellect which discriminates and guides us in doing the right thing. Priyam Bruyaat, Bhagawan says is the Dharmic imperative. It could also be referred to as the Ethical imperative / Social imperative. That is, the truth in the social context has to be pleasing. This must be our social code of conduct and is related to the mind. 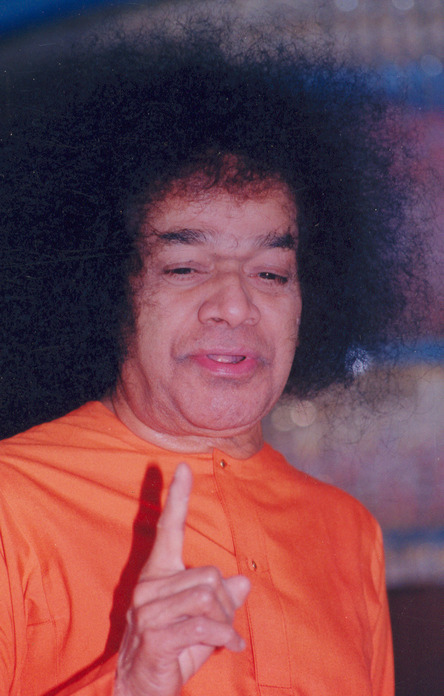 Na Bruyaat Satyam Apriyam, Swami says is the Spiritual imperative. This is at a much higher level and is a subtle imperative. No doubt, we must speak the truth. But a caveat follows. Evaluate whether the truth would hurt somebody, would cause agony to somebody. If yes, avoid speaking the same. Bhagawan ends this module in His own inimitable way, by cajoling us to follow His Message. He says, speaking the truth is indeed easier than even crushing the petals of a flower!! One must truly learn the art of motivating people from Bhagawan!! 1. What is the life for a currency note, a fort and the spoken word? 2. How should we speak in order to command respect in society? 3. What are the two maxims regarding speech that is found in the Vedas? 4. 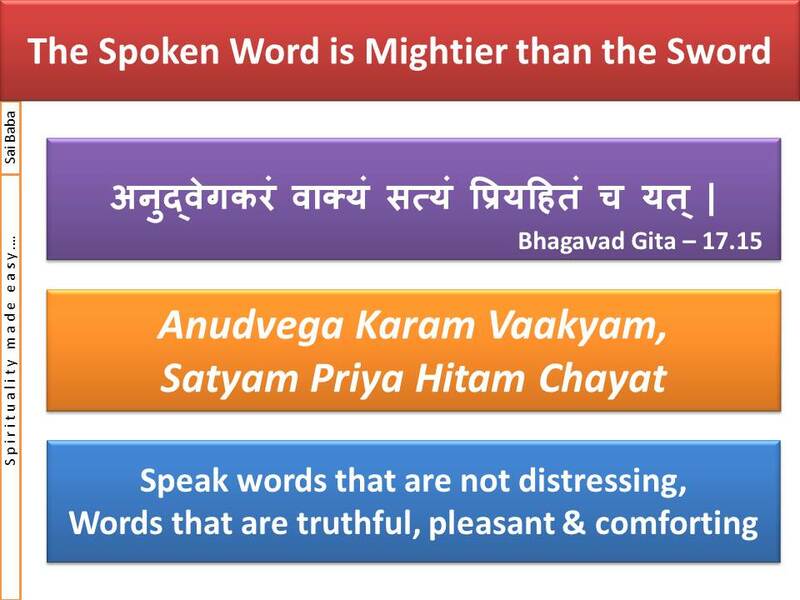 What is the maxim regarding speech that is found in the Bhagavad Gita? 5. In the maxim, Satyam Bruyaat, Priyam Bruyaat, Na Bruyaat Satyam Apriyam; what three types of values do the three phrases represent? 6. What is the caveat that immediately follows the maxim Satyam Bruyaat, Priyam Bruyaat, Na Bruyaat Satyam Apriyam and also Anudvega Karam Vaakyam, Satyam Preeti Hitam Chayat? 7. Finally, how does Bhagawan cajole us to speak the truth always?